Aizawl, Mar 12 : Several orchids found in Mizoram, not having Mizo names, are being rechristened. Mizoram-grown orchids are being compiled in a book with fine pictures to popularise them across the world. A special programme for rechristening Mizoram's orchids was held today at Hla Kungpui Mual (or poets' square) at Khawbung near Myanmar border in Champhai district where a sanctuary of orchids has been established. Khawbung-based forests ranger officer (RO) Lalthazuala, who spoke at the ceremony, informed that the sanctuary is now home to 34 different species of orchids. "It is being developed to house all species of orchids found in Mizoram," he said. Expressing concern over the smuggling of wild orchids into neighboring Myanmar, the forest official said that different species of orchids found in Mizoram were also found in northern Thailand which could mean that orchids smuggled from Mizoram found their way into Thailand. Mizoram State Planning Board member secretary P L Thanga, who attended the ceremony, also given a Mizo name to a species of orchid Thunia Alba as Zomawi. 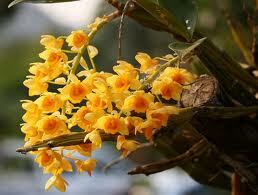 Mizoram has a wide spectrum of orchids growing from the lower elevations to the high hills. The orchids grown in the high hills fetch a good price in the market at Delhi and Kolkata. More than 200 varieties of orchids have been identified in Mizoram till now. In view of the right agro-climatic conditions prevailing in Mizoram, there is an immense potential growing Orchids for large scale commercial purposes. However, wild orchids in Mizoram are under threats of Myanmarese smugglers. "We should take united effort to stop the smuggling of our state's valuable forest resources," C Vanlalena, DFO of Champhai district in eastern Mizoram bordering Myanmar, said. The DFO said they had recovered a number forest goods being smuggled into Myanmar. However, due to shortage of man power and financial constraints, their capacity to check the smuggling was limited.